One of our Aussie pioneer riders, Ray Talyor aquitted himself well in England in 1932, and later with the Wimbledon team in 1938. 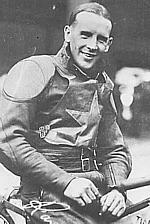 Ray made several official and unofficial appearances for his country as a test rider in Australia. 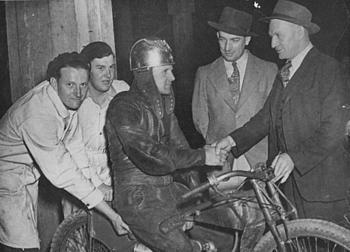 Back home Ray was crowned ' King of the Royal ' for his prowess on the big 1/3 of a mile Sydney Showground Speedway track. He named his bike ' Daisy' and this name was signwritten on the fuel tank. Daisy is now displayed occasionally at the Power House Museum in Sydney, where it is kept. Ray was the catalyst in getting Speedway started at Windsor NSW after WW2 and was in charge of the Windsor RSL Speedway towards the end of the 1967 winter season and also organised the ' one off ' final ever meeting at the track in 1968. Ray ' Broadside' Taylor with us on ' Just Solos ' ...thank you Rahna. 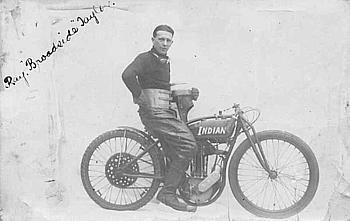 A very early pic of Ray on an Indian bike. 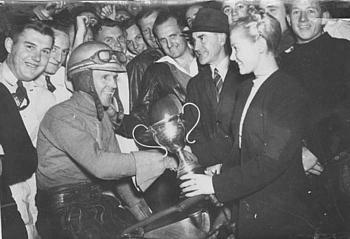 Ray receives the coveted Point Score Trophy off Miss Australia Betty Orme at the Sydney Royale - Circa 1946-47. I can see Jack Chignell and Graham Warren also in the crowd of well wishers. Ray was a Golden Helmet winner at the Royale. 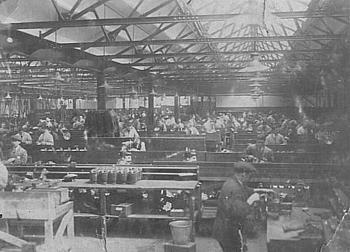 Amongst Ray's memorabilia is this photo of the workers in the J.A.Preswich (J.A.P ) factory in England. A Brisbane programme offering fans an insight into team matches as they might be expected to see if the promoter gets two England vs Australia test matches later in the year. 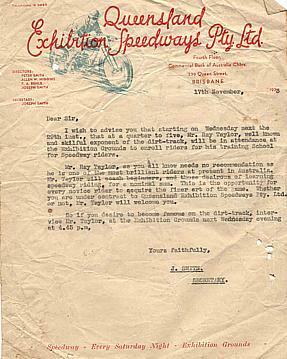 The programme states" if this type of racing appeals to you, let us know and we will repeat it "
A letter from the Brisbane Exhibition promoter in 1933 stating that the brilliant Ray Taylor would be available on Wednesday the 29th at 4.45 pm to enrol prospective riders in a training school to learn the art of dirt track motor cycle racing. 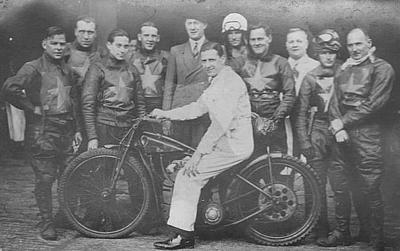 Ray's first appearance back home after riding in England in 1932 was at Wentworth on 26th November 1932. A deep scar covering a fracture of his right cheek bone, an inch below the eye, will always be a reminder to Ray of the lucky escape he had from permanent injury or death on the Liverpool track. Struck by a steel toe plate dropped by another rider, Ray was knocked unconscious sustaining a severe fracture extending from an inch below the eye to the upper jawbone. He was unconscious for three days and was out of hospital after two weeks. A week later he broke a track record at Buffalo Speedway in Paris, France. 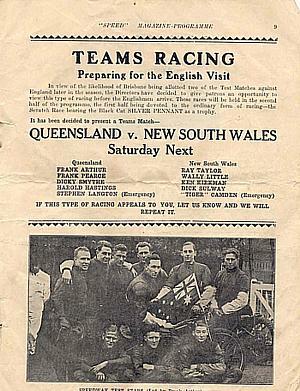 Ray rode in an unofficial Test Series in 1932/33 at the Sydney Royale. In the 5th Test ( as Reserve ) he had 3 rides and scored 6 points. In the unofficial test in 1933/34 ( as Reserve ) Ray rode in the 1st test, had one ride and scored 3 points. In the 1936/37 Test series ( aginst England) Ray was in the Australian team for the 2nd Test at Olympic Park , Melbourne as Reserve, but did not get a ride. He was Reserve again for the 1938/39 Test series at the Sydney Sports Ground on the 11th February 1939, had 2 rides and scored 3 points. Ray rode at # 2 in the 5th Test on February 18th. 1939, scored 4 points and fell during a heat. Thank you to Graeme Frost for this research. 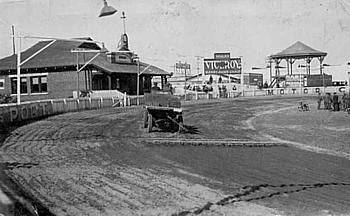 Ray Taylor was on 150 yards handicap at the Sydney Royale for several meetings from March 1, 1947.